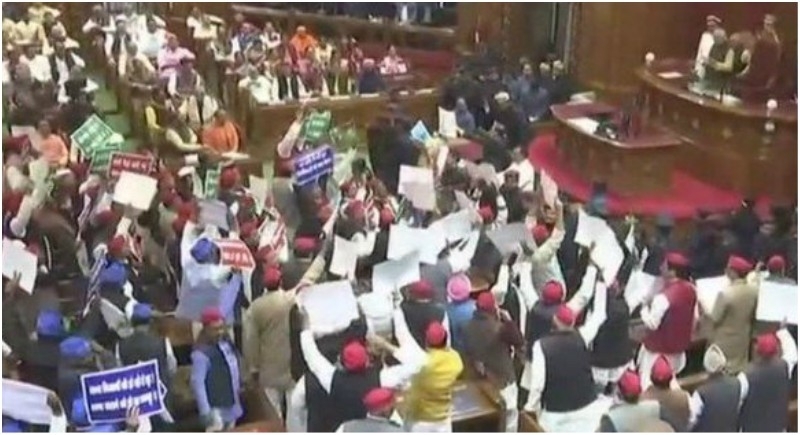 Lucknow, February 5: The budget session of the Uttar Pradesh Assembly was off to a stormy start today, as shameless legislators of the Bahujan Samaj Party (BSP) and Samajwadi Party (SP) hurled paper balls, raised slogans and climbed on chairs, while Governor Ram Naik addressed the joint session. SP and BSP lawmakers, in a bid to pose as a formidable opposition after the tie-up for the Lok Sabha polls, raised slogans, "Rajyapal wapas jao (Go back Governor)," as he read out his speech highlighting the achievements and schemes of the Yogi Adityanath-led Uttar Pradesh government. "The way slogans were raised against the Governor and SP members threw paper balls at him is condemnable...Now you can imagine what kind of system these people want," said Chief Minister Yogi Adityanath. Amid the pandemonium, the Governor's security staff used cardboard files to deflect paper balls thrown at him by Opposition lawmakers. SP and BSP legislators protested against wide-ranging issues like law and order situation, women's security and farm crisis. The state Budget is likely to focus on the agriculture and infrastructure sectors and it will be people friendly. The budget session will continue till February 22.